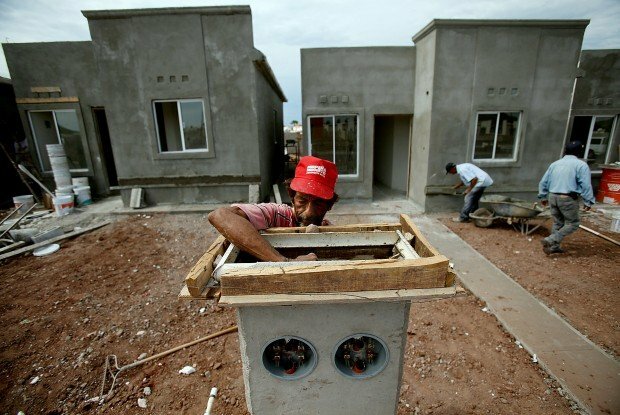 Porfirio Lopez Miranda is part of a construction crew that is building a planned community of middle-income homes in Guaymas, Sonora, that includes underground utilities. Similar housing projects are going up in Nogales, Sonora, and Hermosillo. Mexico has made significant improvements to the port in Guaymas, Sonora. The huge investments in infrastructure - from airports to seaports, highways and railroads - have boosted trade and caught the eye of manufacturers around the world. Jose Luis Castro Ibarra, second from left, the Port of Guaymas director, talks to Tucson Mayor Jonathan Rothschild, center, and Marisela Solis de Kester, small-business advocate for Tucson, about the port's expansion. Carmen Perez serves food and drinks to workers at an industrial park in Guaymas, Sonora, that is owned and operated by The Offshore Group, which is based in Tucson. It is the fastest-growing state with the fastest-growing middle class in Mexico. In 2011, its economy grew 7.5 percent and a housing boom - unlike anything seen in the region for decades - is under way. Now Sonora's aerospace, medical, automotive and produce industries are being wooed by Arizona's neighboring states with promises of faster and friendlier entry into U.S. markets. Faced with the threat of losing a vital economic opportunity, Southern Arizona political and business leaders are trying to build relationships and secure deals in Mexico. Tucson Mayor Jonathan Rothschild recently conducted a trade mission to Mexico, determined to show his southern neighbors that the city and region want to be business partners. "We have got to stop dithering," the mayor said after his visits to Guaymas, Hermosillo and Mexico City. "We're going to see our community shrink and our economy shrink if we don't work on every economic advantage we have … such as being the closest large city north of Sonora." Rothschild said it was "eye opening" to visit the manufacturing sites in Sonora and see the level of sophistication and the number of international companies operating there. For part of his visit, Rothschild was joined by Phoenix Mayor Greg Stanton, who had a large group of city leaders in tow. "We're competing with California and Texas, but we're also competing with Phoenix," Rothschild said. If warehousing, shipping or intermodal facilities aren't plentiful in this region, manufacturing companies in Sonora could simply change routes and bring goods into the U.S. through ports of entry where they are being courted with incentives such as twin plant operations and investments in technology. "They can head west, they can head east or they can drive right through," Rothschild said. "They don't need us." Mexico is now the No. 1 maker of television screens in the world and exports more cars than Japan, Korea or Germany. In Hermosillo, Ford Motor Corp., is doubling production and hiring 1,000 workers to build the new Fusion model that will roll out of the factory this year. Forty-three countries have trade agreements with Mexico and The World Bank says the country outranks China, India and Brazil for ease of doing business. A recent example: In July, British turbine manufacturer JJ Churchill signed a lease for a new, $9.6 million plant in Guaymas, Sonora. One month later, the land was being cleared and prepped for the facility. 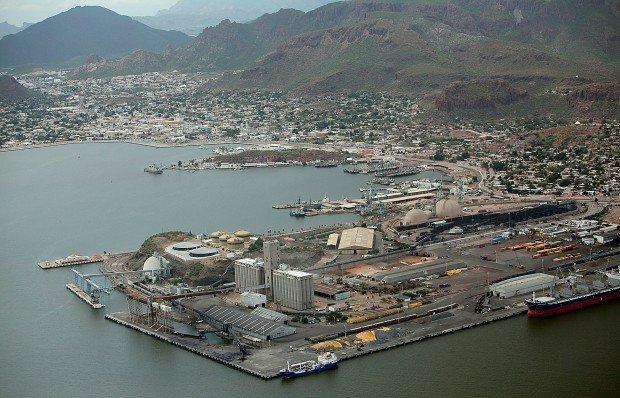 The Port of Guaymas, which received its first shipment of container cargo in February, is doubling its size and capacity by expanding into the bay with neighboring Empalme. And just on the other side of the border in Nogales, Sonora, houses with underground utilities are popping up in planned communities to accommodate the growing middle class working in the manufacturing industry. Southbound, Arizona's top export partner is Mexico. Of the $17.7 billion in exports from Arizona last year, $6 billion went to Mexico; $2 billion to Canada and $1 billion to China, the Arizona Commerce Authority said. The amount of other countries' imports of Arizona goods are in the millions of dollars. Unlike China, Mexico relies on U.S. distributors for manufacturing materials. "Most of the $6 billion worth of trade is in materials that go to those factories and operations," said Fernando Jimenez, the Commerce Authority's international trade and investment vice president. "We're really plugged in to the supply-chain part." He said for every $1 million worth of exports, 14 to 16 jobs are supported or created in the exporting state. "That's paying the bills on this side," Jimenez said. "We tend to forget that we are in an exciting geographical location." Rising transportation costs and a desire for more oversight has high-tech manufacturers pulling plants out of China and opting for "nearshoring" in Mexico. "This is a real opportunity for us," Luis Felipe Seldner III, president of Tucson-based The Offshore Group, told the mayor and his entourage during their visit to the company's industrial parks. Offshore operates manufacturing plants in Mexico and is the largest private-sector employer in Sonora. "When it comes to low-skill, high-volume manufacturing, we can't compete with China," Seldner said, referring to items such as T-shirts and toys. "But in the highly skilled manufacturing arena, Mexico is getting some attention." Although expansion of the Mariposa Port of Entry in Nogales is under way, the state is way behind the infrastructure improvements in other border states. For years, the commercial port has been plagued by bottlenecks and long lines of idling trucks, especially during the peak produce season. And Mexico's coveted produce industry is something Texas is trying to lure. Earlier this year, the Rio Grande Valley's congressional delegation was successful in lobbying the USDA to allow McAllen, Texas, to construct border facilities that blast fruits and vegetables with a beam of electricity to kill pathogens and pests versus using heat, which reduces the produce's shelf life. "The difference between Texas and Arizona is that Texas is very focused on the economic impact that their ports have," Nogales Port Director Guadalupe Ramirez said. "They are very aggressive in courting new business." Jaime Chamberlain, president of Nogales, Ariz.-based J-C Distributing Inc. and past chairman of the Fresh Produce Association of the Americas, cringes at the contrast between the two states. "We need to be talking about economics and how to make our state and region stronger," he said. "Arizona's thinking is really small. We have made ourselves the state of controversy." Chamberlain said any significant loss of produce suppliers to Texas could devastate Southern Arizona. "I have a 100,000 square-foot building here and if it becomes easier for me to do business in McAllen, Texas because their port is open 24 hours a day, then I'll move to Texas and take my $80 million worth of business with me," he said. "And I'm just one." Ramirez is hopeful the expansion of the port will keep Arizona competitive and become a 24-hour operation. "The new facility gives Arizona a fighting chance to keep the business we have and recruit more," he said. "When the economy is in the state that it's in, your ports of entry can help spark things." The one clear message that Mayor Rothschild said he got from his visit south of the border was that Southern Arizona has much to gain - and lose - as Mexico's economy continues to grow. He wants to restart the effort to develop a regional logistics hub. For more than a decade, the city operated Puerto Nuevo, a project to create a site where trade from Mexico could be received and stored, then shipped by rail or truck throughout the country. That effort folded in 2007 and the city handed the project to Tucson Regional Economic Opportunities, Inc.
A year later, TREO unveiled a "strategic map" to highlight the logistics companies operating in the area with the hope of luring more of those businesses to the region, but the recession pulled TREO's attention in other directions. More than 150 companies in the Tucson area specialize in trade logistics, from warehouse operations to intermodal facilities. On Tucson's southeast side, the Port of Tucson to many validates the viability of turning Tucson into an inland port. The 16-year-old port has added warehouses and rail and is again expanding. Tucson City Manager Richard Miranda wants to hire an international business expert who understands the relationship with Sonora and its potential impact on Tucson. "We are now seeing some cautious recovery and making some investments in Sonora makes sense," he said. "It's important for me to have someone in city hall. We need to send the message that Tucson is open for business." One step being spearheaded by the city is trying to secure a direct flight from Tucson to different cities in Mexico. Along with TREO, city leaders are negotiating with a Mexican airline to fly in and out of Tucson International Airport. City and state officials in Sonora are also looking at offering incentives for airlines to restart those flights. TIA lost its last direct flight to Mexico in 2008. "There's a lot of buzz about logistics right now," TREO CEO Joe Snell said. "We were on that path, then the recession put things on hold. Now, the timing is right and there's renewed interest. "The mayor's visit was the tip of the spear." A study by Princeton, N.J.-based The Boyd Co. Inc. says Pima County could add more than 5,000 jobs with wages and salaries totaling more than $200 million annually by 2030 if the region created an inland port by recruiting more logistics companies to the region. And the Metropolitan Tucson Convention and Visitors' Bureau estimates that Mexican visitors to Arizona's malls, restaurants and hotels spend more than $1 billion each year. Business leaders say it's critical for politicians to join the private sector in pushing for more staffing at the ports of entry in Nogales to ease the entry of trade and tourists. "All city and county governments should be lobbying hard to insure funding for the new Mariposa Port of Entry," said Michael Hammond, president and CEO of Picor Commercial Real Estate Services, which does extensive business in Mexico. "The average time to cross into the U.S. should be 10 minutes or less," he said. "If so, we would see an impact in retail sales immediately." The man overseeing the northern flow of trade and tourists at the Nogales ports of entry would like to do just that. "As residents of Arizona, we have to recognize that economic indicators show that there should be more trade and travel," Ramirez said. "The ports of entry are your front door." He said it's "inevitable" the new port become a 24-hour operation. "It's too large of an investment," Ramirez said. Rothschild said he plans to spearhead advocating for increased port staffing and hours of operation by lobbying Arizona's congressional representatives. If need be, the mayor plans to go to Washington, D.C., to make the case for funding. "If a large part of a mayor's job is to help stimulate the economy then I have to focus on those areas where our region has an advantage over other regions," he said. "It's silly for a region of 1 million people to cut itself off from another region of 1 million people." Sonora's growing economy and middle class will have a significant impact on Southern Arizona. The Star will publish an occasional series on the subject in the coming months. Overshadowed by drug violence, Mexico's emerging economy surprises many. Jeff Flake on Why is Arizona lagging in business export growth to Mexico? Richard Carmona on Why is Arizona lagging in business export growth to Mexico? Tucson Regional Economic Opportunities Inc.